END-ZIT® is intended for use on blemishes only. This advanced formulation is designed to dry and aid in elimination of pimples. It is make-up quality for excellent coverage of the blemish. It is unbelievably effective, medicinally eliminating pimples. May be used under make-up or alone. Untinted formula (intended for nighttime use) is a bit stronger than the tinted END-ZIT® Blemish Dry Lotion. It was featured as an Editor’s Favorite, ALLURE Magazine, July 1993. This is definitely a “must have” product. 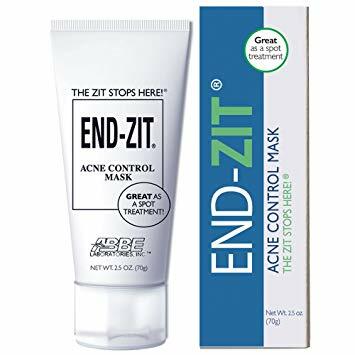 (END-ZIT® was formally known as B-X®). DIRECTIONS: Shake bottle well before each use. Apply directly to blemish only, using applicator. Wait a few moments until slightly dry. Pat with fingertip or clean cotton swab to blend color to skin. Make-up may be applied if desired. Should remain on skin all day. Re-apply at night to clean skin to remain on skin overnight.